Electric cooperative consumermembers are showing an increased interest in cooperative solar. Hoosier Energy and member systems developed the My Solar program to give your consumer-members direct access to solar energy. This program is already being offered by several member systems. It allows consumer-members to use solar energy within their home or business without installing or maintaining a private solar structure. Participants are able to use output from the ten 1-megawatt solar arrays serving their area. The My Solar program offers members the opportunity to purchase up to 12 solar panels. The size of the panels vary between the 10 solar sites, but average ~330 Watts. In one year, one panel will produce ~450 – 500 kWh. Each participant is limited to 12 panels – approximately four kW. 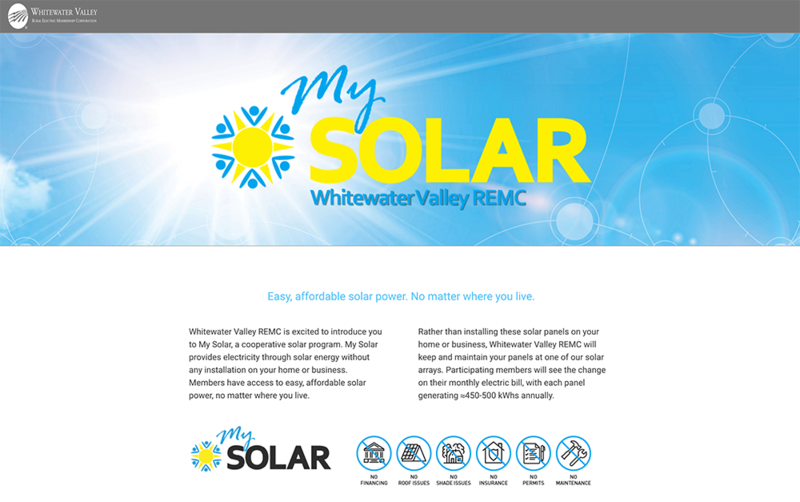 The My Solar program is available for any home or business and is a great opportunity allowing consumer-members to diversify their energy source. The My Solar website also provides consumer-members with a real-time snapshot of the amount of solar energy being produced from the solar panels by allowing users to select the number of panels they have purchased from their electric cooperative. The page also shows the savings in relation to gallons of gas saved and acres of trees planted. Hoosier Energy provides its member systems with marketing materials to promote this initiative including flyers, bill stuffers, yard signs, window clings, videos and a customized website.